Lest we forget: More himself was directly responsible for the burning at the stake for their beliefs of six Lutherans. More positively the devotion of his daughter Margaret to her father is one of history’s more touching stories. Yes indeed. Margaret’s story is truly touching. For those who aren’t aware, Margaret’s final act of devotion to her father was to be buried with his head in her arms. Hi Dave! A group of friends this week mistakened me for an atheist, but I explained I am not. I powerfully believe in God, though I don’t consider myself religious. 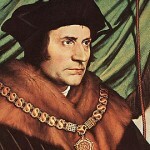 The current economic crisis–all the greed, corruption, liars and Teflon politicians who go unpunished–can certainly learn a lesson from St Thomas More and his finality. But today it seems, those deserving punishment get none; the people deserving acclaim get none; we only reward bad behavior–we expect it and look up to it. Life is not without a sense of irony–but all this is unironic. That’s my word for today . . . unironic. Well, the corruption is certainly no illusion in the state of Illinois. I think the state should change their method of selecting candidates. Instead of electing someone and spending all the money to send them to jail, just make one of the criteria that they already have to be in jail to get on the ballot. At least there will be no secret about what you are getting.